Friend A is inviting you to sit and chat. Relax. This space is casual. Friend B is saying, I love to cook! This space is more about function. This leads me to the reason you need a focal point, to help give the room a purpose! What’s a room without a purpose?! When you give a space meaning, it’s a reflection of you and your life and your style. So what are some ways you can add or emphasize a focal point? Take a peek at some suggestions below. Architectural elements like a fireplace with a mantel or built in bookshelves can add character and an automatic focal point to any room. They're also great features you can use to display treasured items. Plus you can change these up easily to match seasons or current holidays! This is a great example of adding a pop of color to bring your attention to something. In this space your eyes go to the chair and then follow all the accents of blue around the room. You can choose to add multiple shades of one color, or mix things up and add a few coordinating colors. Add fun patterns to one wall. 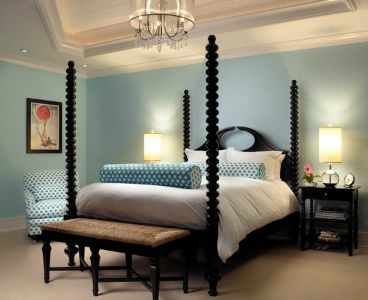 They can blend with the color palette of the room or be bold with large scale prints or bright colors. See in the first image how the wallpaper makes a statement but blends in color? The second image does a great job of catching your eye with a bold print and bringing the room together. Tell me you don’t notice the bed first? You do. Because it’s grand with fun detail and rich contrasting dark wood. Then you notice the calming blues and inviting space and you just want rest. And isn't that what a master bedroom should be? A retreat in your own home. So there you have it, a few tips on how to bring your space together.